As I have written before here, I am rarely home on weeknights because if I am not teaching I’m attending a concert, performing, going to school (I am currently pursuing a Masters in Creative Writing) or traveling somewhere. On the rare weekday nights in which we happen to stay home, I do get into the kitchen to make Renata and I a nice home-cooked dinner with ingredients that are not hard to find. Considering that the nearest supermarket is about a 20-minute walk away (and then coming back up the hill it’s uphill all the way), I need to keep it simple. When we travel I hardly ever have access to a full kitchen, but when I do I rarely set foot in a restaurant. I recall traveling to our time-share in South Carolina, stocking up at the local Piggly Wiggly’s and then doing all of the cooking there. Same when we travel to Brazil, since we usually stay at my mother’s and not only does she have a very spacious kitchen but she also happens to live across the street from a 24-hour supermarket. 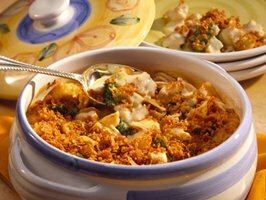 During winter, I have a preference for casseroles or soup because they tend to be easy to make and the end result is usually great. During summer, however, I do like making grilled meats (chicken, fish) and vegetables or cold pasta dishes because the last thing I want to do is bake a lasagna and end up not being able to walk into the kitchen at all. I remember one summer that I stubbornly decided to prepare a mushroom and egg bake – a stupid mistake that made me feel nauseous the entire morning – it was so bad that I had to call my group at church and tell them I wouldn’t be able to make it, which is something I almost never do. It was a lesson learned, and today the oven gets its vacation whenever the mercury reaches over 80 degrees. Cook pasta according to package instructions until al dente. Drain, reserving 1 cup of the cooking water. In the meantime, melt the butter and stir in flour to form roux. Slowly add milk and stir until thickened. Remove from heat and add tuna, salt and pepper, hot sauce and peas. Mix with cooked pasta and add some of the cooking water if the pasta seems dry. Put mixture on baking sheet, sprinkle with breadcrumbs and bake in oven at 300 F until heated through, about 20 minutes. Let rest for 5 minutes and serve with green salad.